Juno and Topper welcomed 10 beautiful puppies into the world on April 9th. Available puppies will be posted closer to 6 weeks of age when conformation and personalities can be determined. What does my new puppy come with? All of our puppies are bred for quality and handled with LOVE! See a puppy you want to make part of your family? First, pick out your new family member and view our Puppy Contract/Health Guarantee (see below). Please fill out our puppy application, when you are done just hit the submit button. After we review the application, we will make the decision to approve you for one of our puppies. If you are interested in co-owning please email letting us know. We are very strict about Full Registration (Breeding Rights) as we like to protect our lines. Please be ready to provide references if this is what you are looking for. There is an option to pay the deposit at the end of the application, there is a 3.5% convenience fee for doing it through Stripe. An application must be sent at the same time as a deposit. If your application is not approved, your deposit will be returned. Deposits are $300 and are NON-REFUNADABLE. ​ Once your deposit is received and puppy is PAID IN FULL, the puppy will go to his/her forever home at 8 weeks of age. If you are unable to get your puppy at 8 weeks, there will be a $20/day charge for holding. ​ ​ We will keep in touch with the puppy 's new family with pictures and updates throughout the puppy's stay with us. 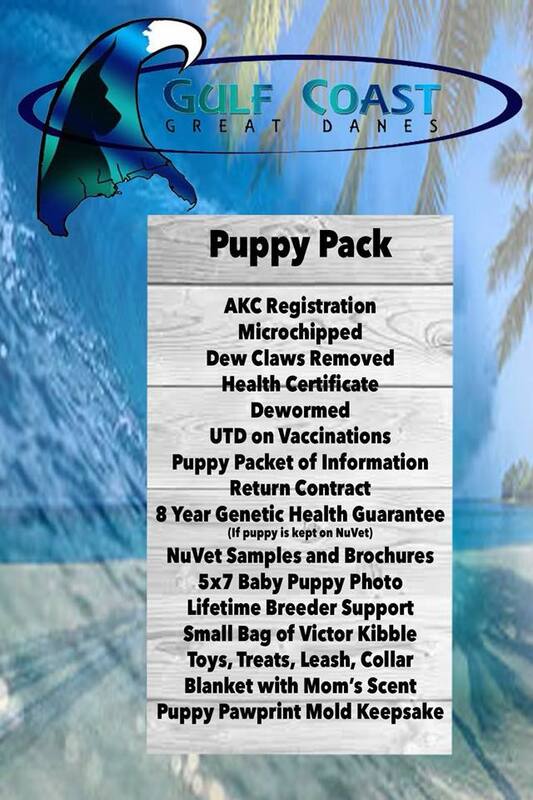 Prices are discounted by $50 for each puppy if there is more than one puppy being transported. These prices are set for one puppy to be personally delivered up to five hours one way. We set the flight up for you through Delta or United PetSafe. Price includes flight, kennel, flight certificate, food bowl,shipment of puppy pack, and travel to and from airport. Professional shipper that has set rates that can deliver the puppy straight to you. They can offer cheaper rates because they usually are delivering more than one puppy along the way. If interested in co-owning please call for more information. *Not all puppies or homes will be approved for breeding rights. Any puppy with promising conformation typically will only be available for co-own.